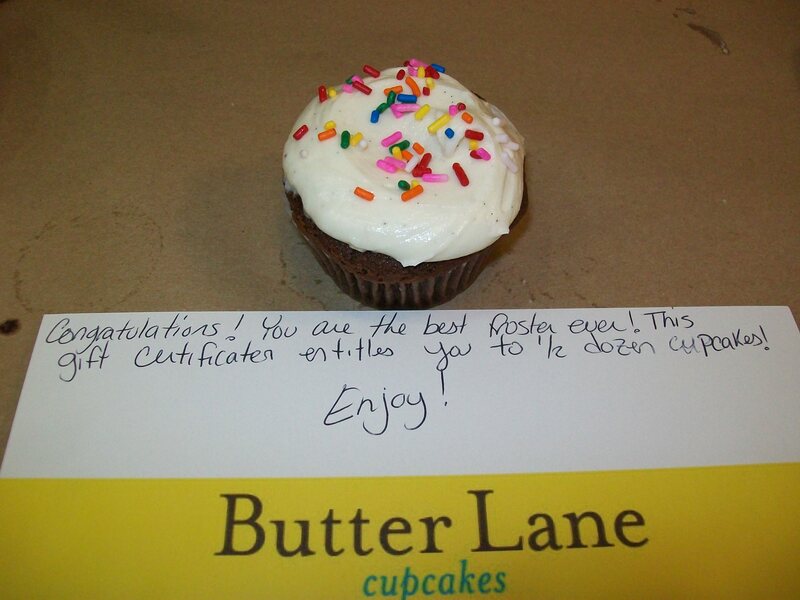 One of the new year events in my dorm involved going up to Butter Lane Cupcakes for a baking class. 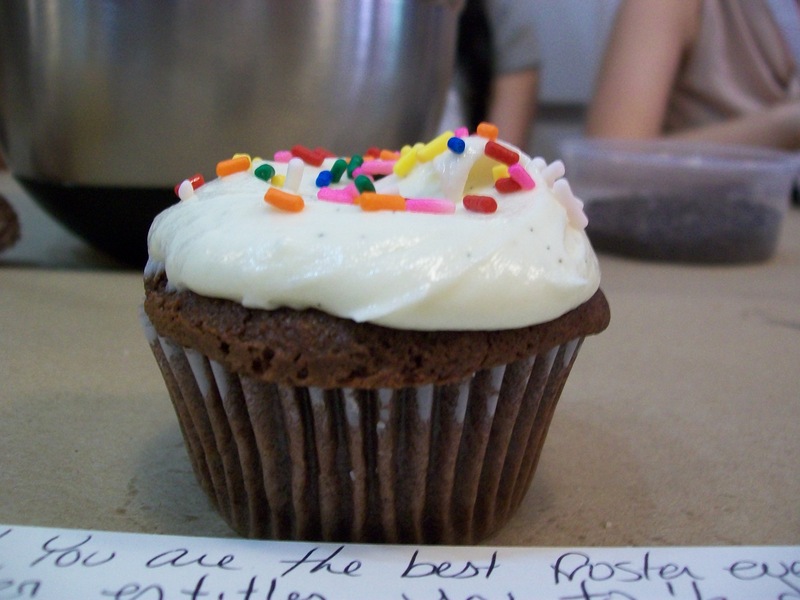 For the low, low price of $10 plus subway fare, 15 of us got to bake five different kinds of cupcakes with six kinds of frosting. We made vanilla, chocolate, banana, vanilla/chocolate marble, and banana/chocolate marble cupcakes with vanilla, chocolate, cream cheese, chocolate peanut butter, raspberry, and cinnamon buttercream, plus assorted sprinkles and jimmies. I got to use a Kitchen Aid stand mixer for the first time in my life, and boy if I didn’t want one badly before, I REALLY want one of those babies now. Normally I don’t have the patience to properly cream together butter and sugar, but with this it’s no problem! I was coveting the light pink one they had stashed under one of the baking stations. 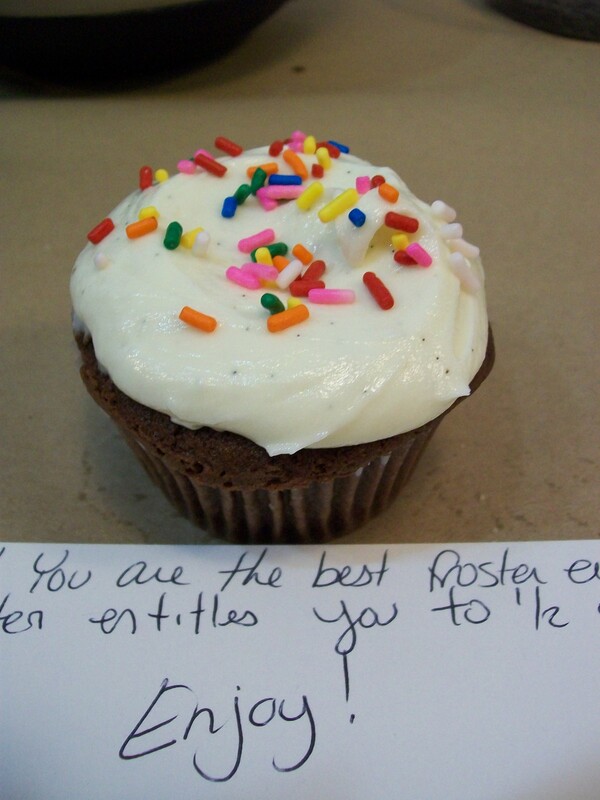 My group was charged with making the vanilla cupcakes and vanilla buttercream. I wasn’t terribly thrilled about this at the start–mostly because I wanted the chocolate ones–but I ended up liking my group and our final products well enough. We all took turns adding the different ingredients, and thankfully we didn’t mess anything up too badly, unlike the chocolate group behind us. One of the guys (of course it was a guy, haha) poured the entire cupful of water directly into the batter without measuring out the proper amount. Now, I’ve done that a few times in my life with buttermilk, but at least that was in the privacy of my own kitchen and not in front of 14 other people and a professional pastry chef! Needless to say, this poor boy’s actions did not escape unnoticed and he was promptly called out on them and received a good ribbing from the rest of us. All the cupcakes went into the oven and baked up. 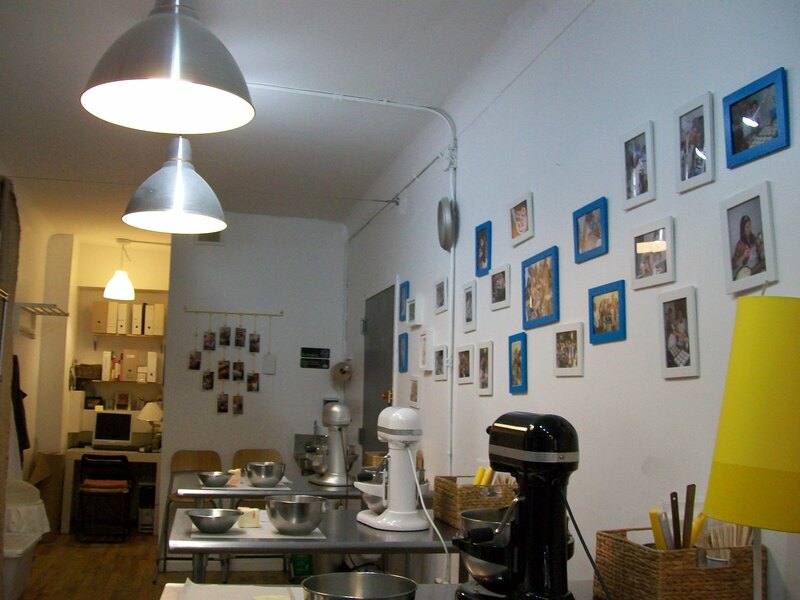 While they were doing their thing, we sampled some of the bakery’s products. Wow did they look good. I didn’t taste anything at the time, but I didn’t mind. More room for me to eat my own creations! Then came the delicious buttercream. 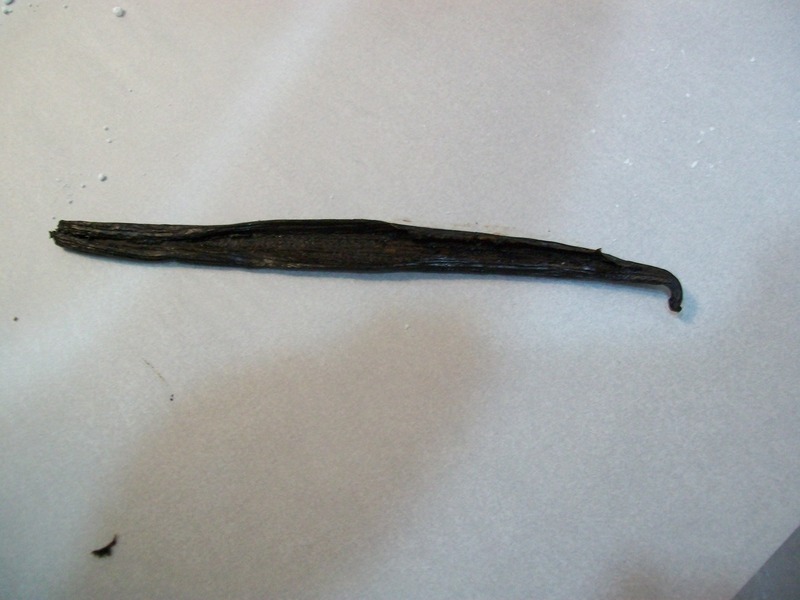 We even got to use a real vanilla bean in it. 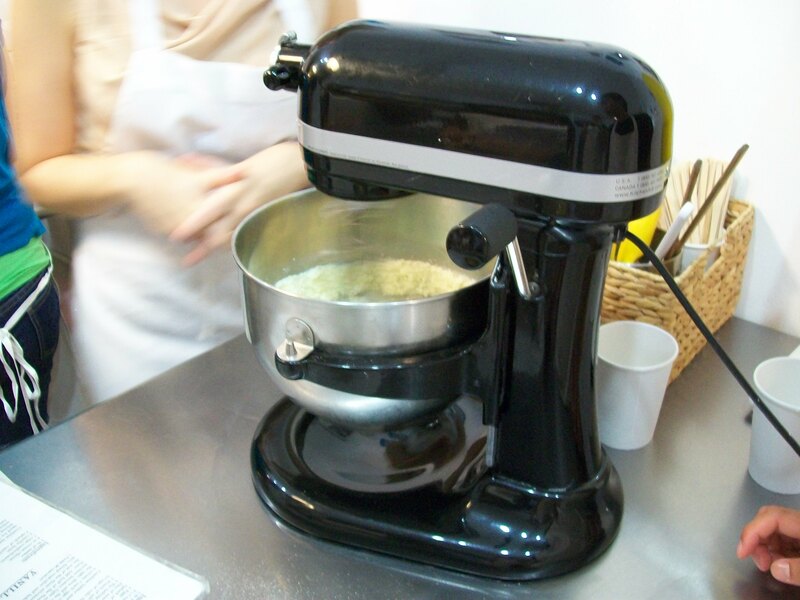 Now not only do I want a Kichen Aid stand mixer, but I’m dying to use real vanilla beans! 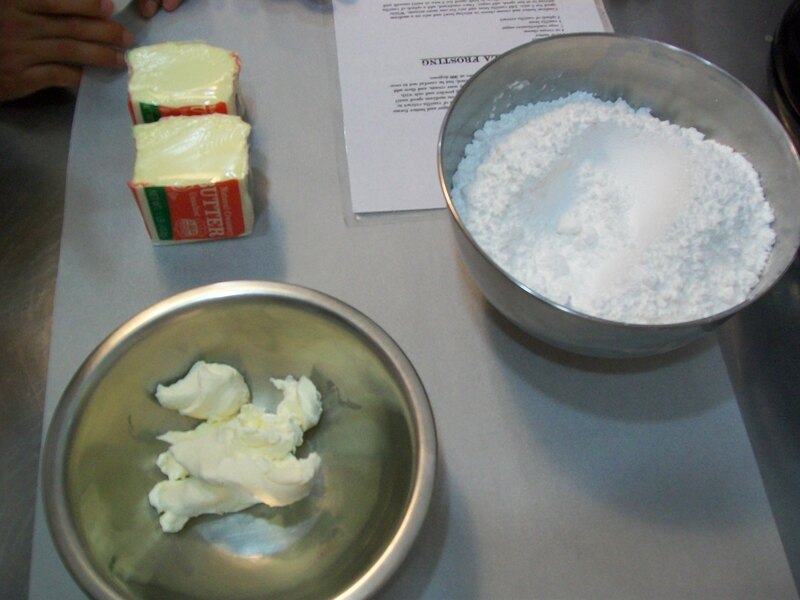 Before we added the powdered sugar to the butter and cream cheese, one of my own group mates wanted to taste the powdered sugar, but the girl who passed him the tasting stick stuck it into the butter/cream cheese instead. He then decided he would taste the two together, and so he dunked another tasting stick into the sugar and attempted to sprinkle the sugar on top of the butter/cream cheese stick. You should have seen the look on the woman’s face who was instructing us. It was hilarious. This resulted in the dreaded cinnamon challenge. Him, another group mate, and the water boy all came forward for a secret challenge the woman put forth, since they seemed so eager to eat weird things. She lined them up against the wall and gave them each a tablespoon of cinnamon. The person who ate it all first won. As soon as the cinnamon passed each of their lips, puffs of cinnamon immediately spurt forth from their mouths as they tried not to choke or die. It was absolutely HILARIOUS. I got video of it, and myself and my roommate relived those moments when we got home. 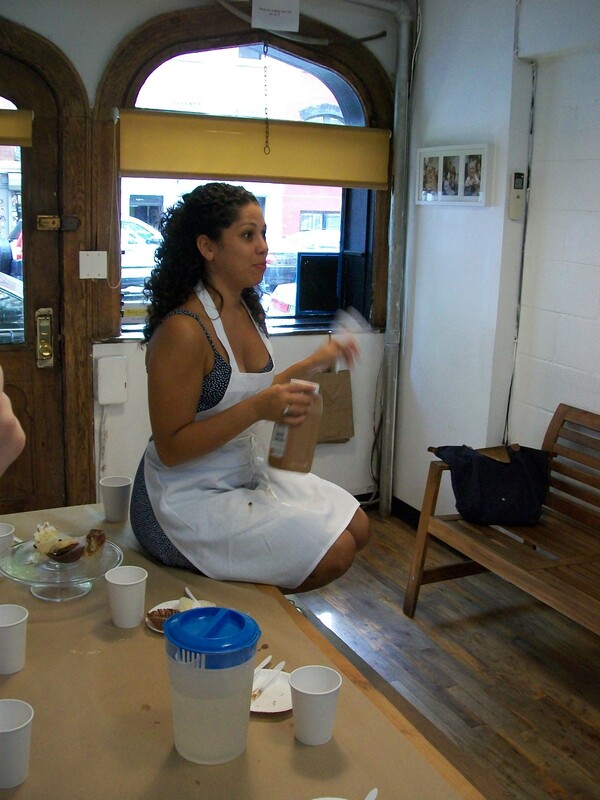 After we finished the cinnamon challenge and making the buttercream, we had a frosting competition. By this time the frosting was in sore shape because it was melting due to the room’s temperature and the amount of times we’d handled it. The butter just wasn’t holding up as well as I hoped it would. 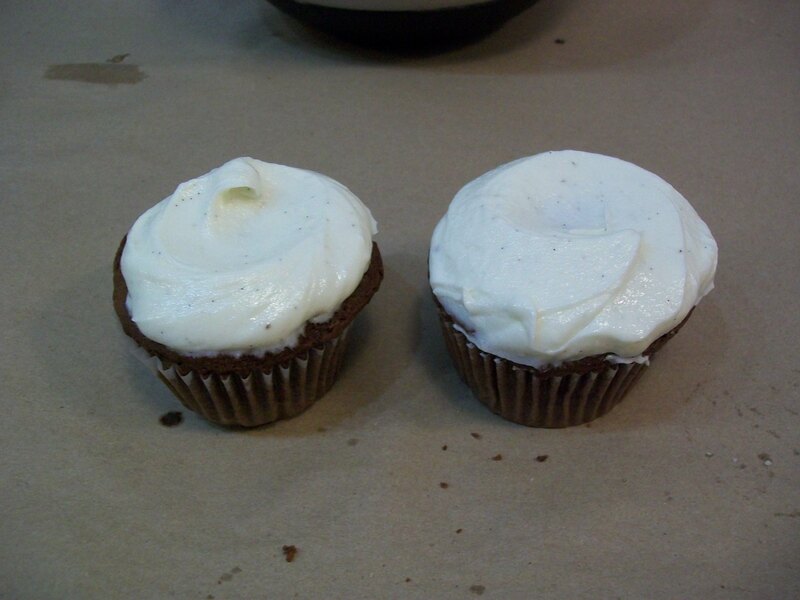 Our instructor showed us how they frost them in the bakery and then let us try our hand at doing the same. Sadly, most peoples’ didn’t even come close, but we all had lots of fun trying. However, I wasn’t just in it for the fun. I was in it to win the prize, and I did! 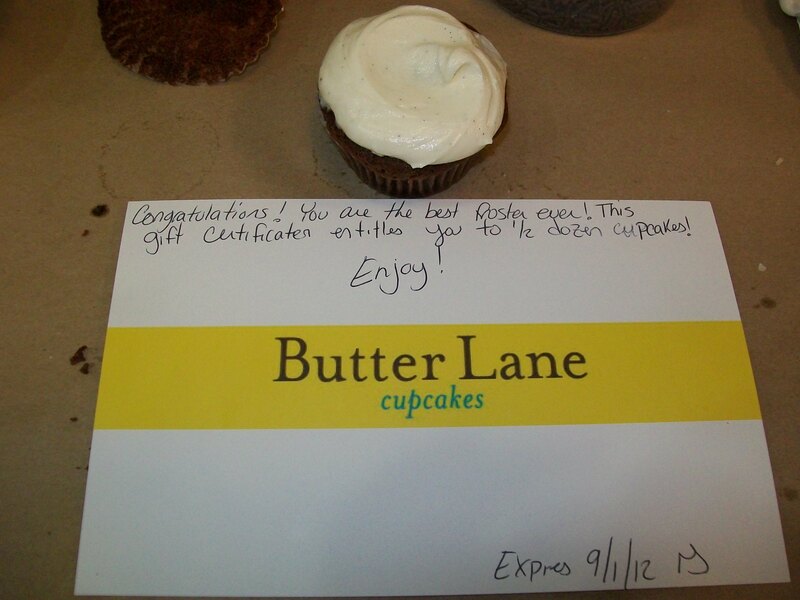 I had the best cupcake of the bunch, and for that I won a gift certificate for a free half-dozen cupcakes! I’m not sure when I’m going to go back and claim them–possibly for a special occasion for myself and my suitemates. It doesn’t expire for a year, so I have plenty of time to decide. 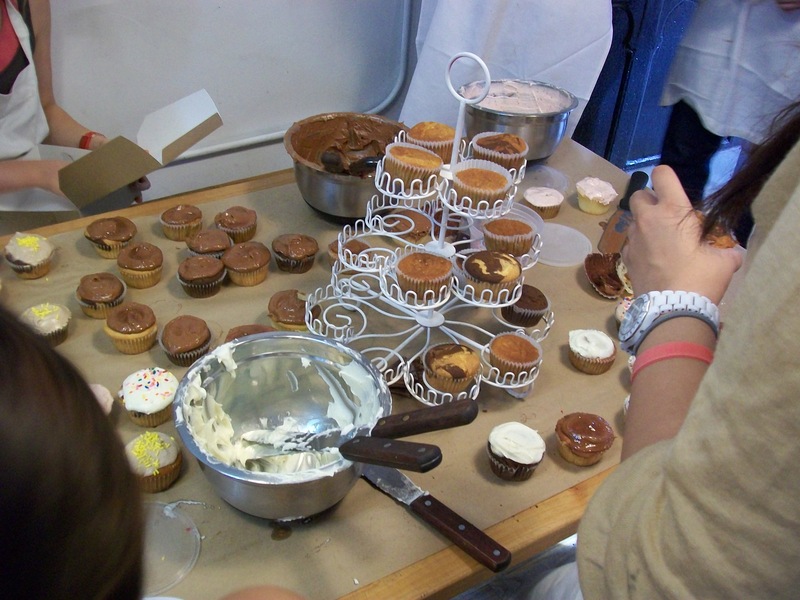 We made SO MANY cupcakes. 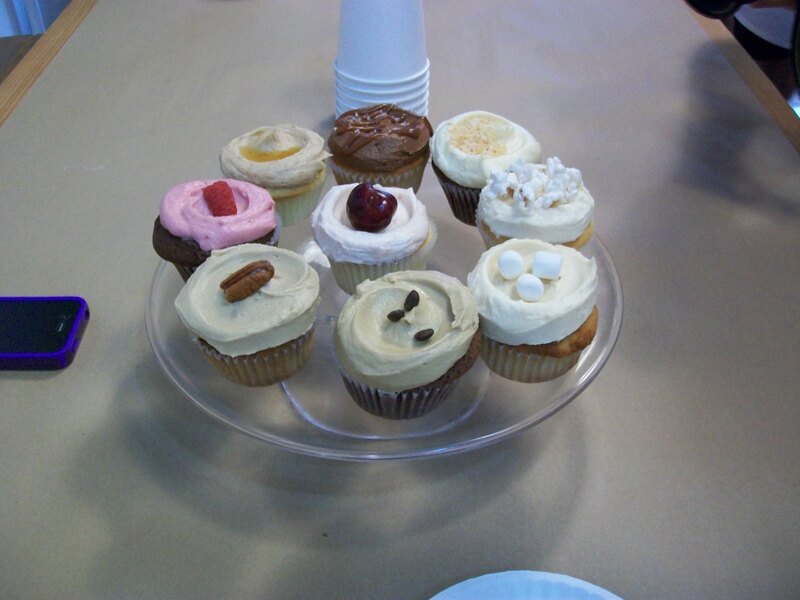 Each batch yielded 36 cupcakes, and we made three batches. 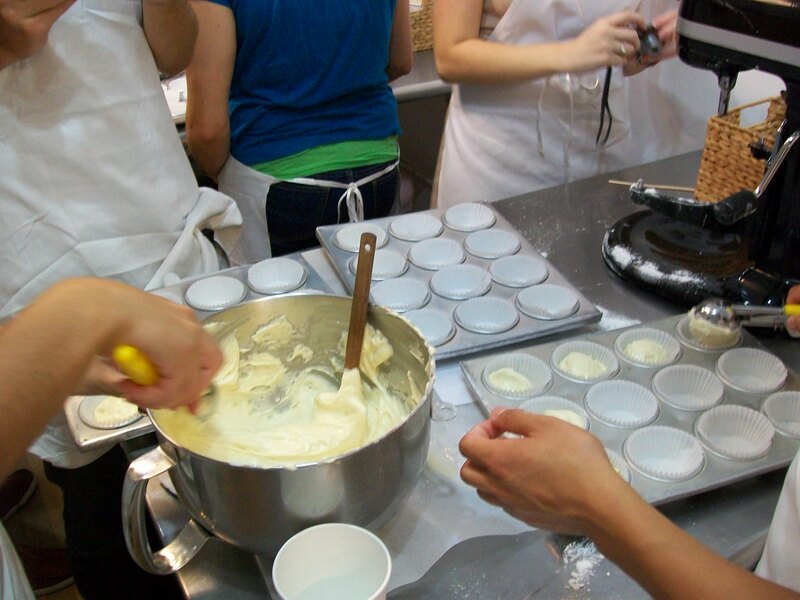 We ended up with 108 cupcakes to frost and split among the 15 of us. I think a lot of us got overwhelmed while we were frosting them, because the pace definitely slowed down about halfway through. We frosted, decorated, and boxed up our creations to take home. 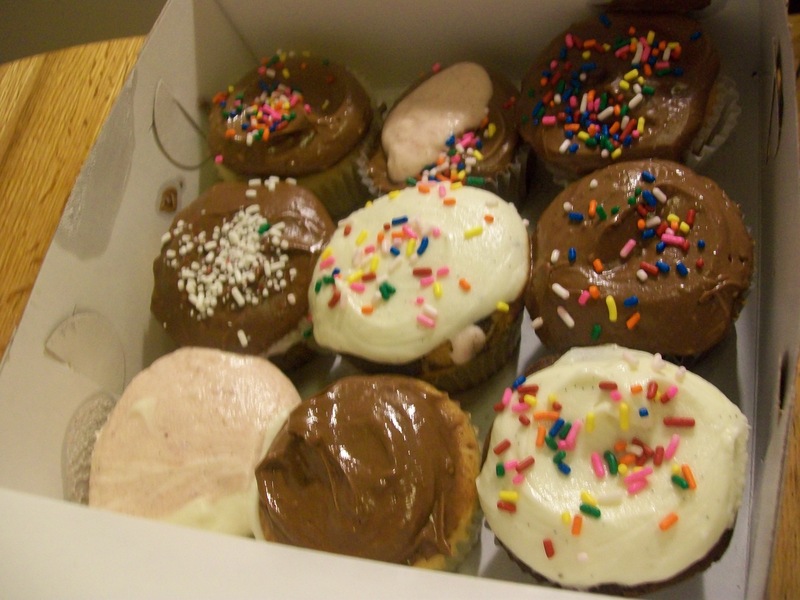 Since I went with my roommate, we took home 18 cupcakes because each box held 9. I don’t know how the four of us are going to finish them all; we might have to go knock on some doors in the hallway to pass some out before they get stale. It would be a pity to waste them. All in all, this was a great trip and I’m glad I went. Originally I wasn’t going to go because I didn’t think I could swing the co-pay, but I’m glad I went. 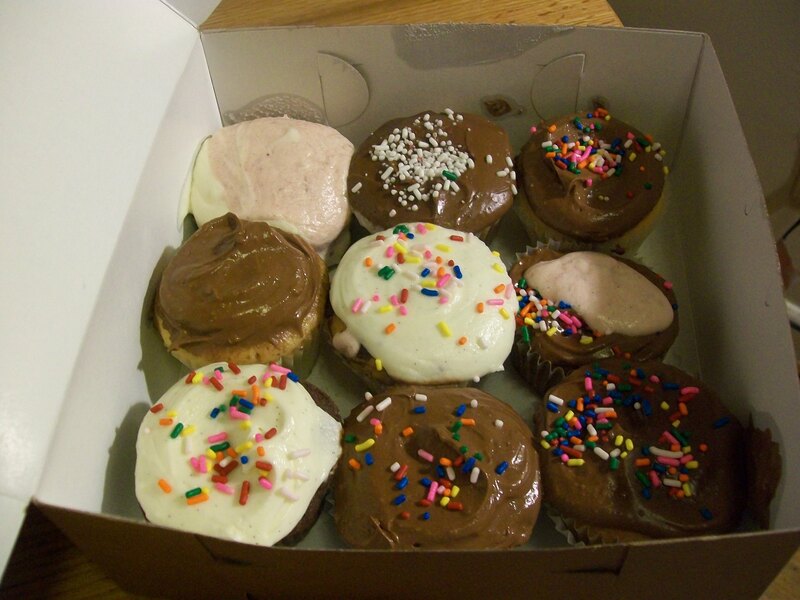 It was a good bonding experience, I met some new people, and I brought home bunches of cupcakes. The buttercream really didn’t hold up very well. It’s melty and all over the place. I wish we could have stuck it in the fridge for a few minutes. Oh well. Most importantly, though, for once I didn’t have to clean up my own mess. That alone was worth the cost.